The Vancouver Canucks are stuck in the same spot the Calgary Flames were for most of the last decade. After making it to the Stanley Cup Final in '04, where they lost to the Tampa Bay Lightning, the Flames toiled in the Western Conference's middle tier. They weren't good enough to contend, but they weren't bad enough to get good picks at the draft. Calgary management's desire to ice a team that could make the playoffs, even if it wasn't a contender, ultimately resulted in a lost decade for the franchise. That's what the Canucks are looking at right now. They made it to the Final in '11, but haven't been close since. First round exits are the new norm for the team that calls Vancouver home. Management and ownership seem pretty set on icing a team that can make the postseason, even if it has no chance to win it all. Simply, Vancouver isn't in the same league as Chicago, Anaheim, or some of the other Western Conference powerhouses. No small retool, defined by a free agency signing here or a minor trade there, will change that. With an aging core leading the way, the time for Vancouver to start the actual rebuild is now. With all that in mind, it's a little bit curious that Vancouver's then-new GM Jim Benning went out and signed goaltender Ryan Miller and winger Radim Vrbata to big dollar contracts last summer. 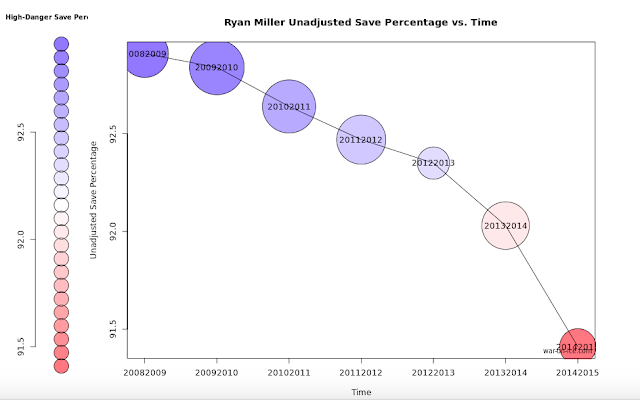 Miller, 34, is likely unmovable at this juncture given that he is getting old and is coming off a major injury. Those things, plus the fact that he was really below average in his first year with the Canucks, likely means that he'll be wearing blue and green when the 2015-16 campaign gets underway. He has two years at $6MM per left on his deal. As you can clearly see, both his unadjusted save percentage and his high-danger save percentage have been trending downwards over the last handful of years. I can't believe the Canucks gave him a multi-year deal worth $18MM total when they have a younger, better Eddie Lack ready to play quality minutes, but they did. The idea of trading Lack will cost Vancouver in the short-term, but they aren't poised to win during his prime anyway. Lack has value. They can likely get a nice chip in return for him. So, keeping Miller around might be both a blessing and a curse. I don't think it's a reach to suggest that he'll help them lose games. The case of Radim Vrbata is a little bit different. Signed to play with the Sedins, he brought some much-needed scoring punch to the team's lineup. He scored 31 goals and 63 points this year; the points total was a career high. What's clear is that Vrbata did help the team win games in 2014-15. What's also clear is that other teams will see a 30+ goal scorer and be intrigued. The time to move Vrbata is now if Vancouver truly wants to rebuild into a contender. Some team will give up a decent pick for a goal-scorer with one year left on an affordable ($5MM) deal. Further, it's not like the rumor mill has been totally silent on Vrbata through the summer. During the postseason, when Vancouver was playing Calgary, coach Willie Desjardins elected to put Jannik Hansen with the Sedins over Vrbata. That caused a stir of media attention in Vancouver, which prompted the asking of a question to the coach. With which phrase did he start his response to why it was Hansen over his 31-goal guy? "Some things stay in the room..."
Any time that line gets dropped there will be more questions, but we haven't really received any more answers. The bottom line is that, when the Canucks needed to win games, their coach didn't play Vrbata with the twins. If some team is willing to give up a decent pick for him, it doesn't seem like the team will mourn the loss of Vrbata too much. Regardless, it just makes sense for a rebuilding/retooling team to trade a 34-year-old asset whose value is likely at a high right now. With the Canucks in desperate need of more picks at the upcoming draft (they currently don't have a second or third round selection in their holster), the idea of trading Vrbata becomes too attractive to ignore. Now, none of this is to say that the sky is falling in Vancouver. The Canucks have a nice group of prospects, highlighted by names like Hunter Shinkaruk, Jake Virtanen, Jared McCann, and others. And then there's Bo Horvat, who was positively phenomenal in his first year with the big club. The key for Jim Benning now is to continue adding to that group. The time to make free agent signings like a contending team isn't now. Instead, it's time to deal away high-value assets for picks and prospects. If that means losing a really popular guy like Eddie Lack and a 31-goal guy like Vrbata, so be it. The long-term gain will likely be bigger than the short-term pain. The goal for Vancouver can't be to simply make the playoffs next year, or the year after that, or the year after that. The goal has to be to bring a Stanley Cup to the west coast. Tough decisions have to be made.